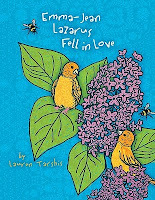 Emma Jean Lazarus Fell in Love by Lauren Tarshis. Grades 4-7. Dial, 2009. Review copy provided by my local library. We first met Emma Jean when she fell out of a tree. Now, the inimitable Emma Jean is back in a sequel that I actually maybe liked even more than the first book. Emma Jean is quite fascinated by her classmates who all seem to have caught "Spring Fever". The Spring Fling is coming up and all Emma Jean's new friends seem to be obsessed with who they should ask to the dance. When an anonymous note appears in Colleen's locker, Emma Jean is tasked with figuring out who wrote it. With her powers of observation and her logical mind, it should be no problem, but everything gets a little more complicated when Emma Jean discovers she's got spring fever, too! What I like so much about the Emma Jean books is the unique voice of the narrator. Emma Jean is certainly unlike any other main character I've read. She's unflinchingly logical and the behavior of her classmates sometimes mystifies her. And, when she starts feeling fluttery every time Will Keeler gets near, Emma Jean's mystified by herself as well. The reader gets Emma Jean's perspective as well as Emma Jean's friend Colleen's, which rounds out the story nicely. Colleen thinks no boy would ever like her, which is why she's so happy to get a note in her locker telling her it's not true. She asks Emma Jean to find out who wrote it, but she also immediately begins feeling better about herself. She describes it as feeling "Colleen-er". Now that she knows there's at least one boy out there who's noticed her, she feels better about herself and is able to relax around people and let her wonderful personality and humor show through. Not only has Lauren Tarshis created an unforgettable, unique character in Emma Jean, her portrayal of the self-conscious, shy Colleen is spot on. Girls who may find themselves in a similar situation will be rooting for Colleen as she begins to come out of her shell. Read more reviews at Welcome to my Tweendom, Book Nut, A Chair, A Fireplace, & A Tea Cozy, and Shelf Elf. This is a Cybils nominee and this review reflects only my opinion, not necessarily the opinion of the panel! I've been wanting to read this for awhile, but now I can't wait! I love Emma Jean! I still need to read this one, but the first book is one of my favorites. Emma Jean!!!!!!!!!!!!! !simply irresistible book...Now not to mention that this is the latest ordered book by me @ A1Books....waiting to get my hands on it.